The Palmeraie district lies about five miles to the north west of Marrakech and legend has it that this extensive palm grove (which contains around 150,000 trees) can be traced back to the 11th century. Apparently, soldiers of the Almoravid sultan Youssef ben Tachfine, after eating dates they had brought back from the Sahara, spat out the stones around their encampment and these germinated over time to form the massive 45 square-mile palm grove that exits today. In 1992, it was in this fertile area of fields, gardens and orchards that Robert Trent Jones Snr established the original 18-hole layout at Palmeraie Golf Club, the first golf course to make an appearance in Marrakech since the fairways of the Royal course were laid out in 1923. 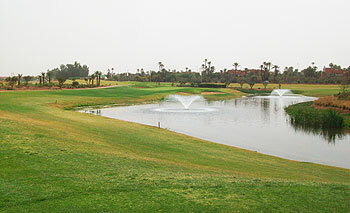 More recently, Stephane Talbot, a former professional at Palmeraie, added a further nine-hole circuit in 2008. Holes 1-9 (the Jbilettes nine) and holes 10-18 (the Atlas nine) were formed as two returning loops and their fairways weave around several large ponds on a site that’s pretty flat throughout. As it’s a resort course, golfers will find the greens here are not as heavily bunkered as those found on many RTJ designs and their soft contours can help golfers post a decent score with a little care. Holes 19-27 on the new layout (called Tensift) are, if anything, more forgiving than the holes on the original nines so the main challenge comes from the well-bunkered, often raised, greensites on this circuit. 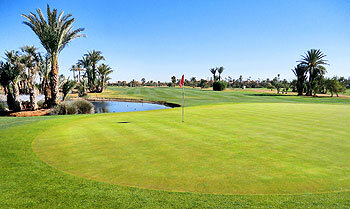 Ranked 19th in Morocco designed by Robert Trent Jones three nines Jibilettes, Atlas and Tensift. We played (in February 2017) the J/A as the new nine was a bit new looking. Overall a good course; if you hit the fairways you get run and if in the rough it slows quickly but is findable making it a pleasure to play. Not spectacular views where the course circled around the hotel where we stayed. Many holes are dog-legs and more of them a semi-circle around a lake making the amount you want to bite-off interesting and challenging. Greens were good and fast and yet will check up a good shot. As a links players we struggled to pitch from the ’cotton-wool’ rough. Beware of 17th par 3- be long. A bit of a mystery playing for the first time as my sat-nav. nor the buggy nav. did not work and made it more difficult clubbing than it was. Recommend play and enjoy ahead of the Royal. A flatter course than Amelkis or Al Maaden but it has enough about it in terms of design for it not to be too much an issue. What does let down Palmeraie is the placement of tee markers near the edges of its crowned teeing areas, which made getting a flat lie for teeing off nearly impossible on half of the holes. Getting away a good tee shot is vital to attacking the fast paced greens from the best position and ideally with a short club in order to avoid the water hazards. Having played only 18 of the 27 holes on site I preferred holes 10-18 instead of 1-9. In my view the first nine is less inspired from the tee with three weak, medium-length par fours (1st, 5th, 6th) but has some solid green complexes with undulating greens (2,3,4,7,8). This nine finishes with a bang, with a difficult par four dogleg right, hugged by a water hazard for all of its right hand side, with the putting surface overhanging the water. The second nine is stronger with only the 10th and 11th being slightly weak. The driving lines are tighter and the lack of definition on a hole such as the 12th appears to be a deliberate design ploy to make players question the best line to take. The line on the 14th is anywhere but left and into the ample pond, or further left into the plush course-side villas. Water is again present on the 15th and 17th with no real bail-out option on the long par 3 17th. The 15th is all about risk-reward and is one of the few such holes in Marrakech where the good player may be tempted to take the risk (of driving the green in this instance) balanced against dunking their ball in the hazard on the right. The 400 yard 18th is a good finish with a short iron all that is required after a good drive. Made easier if you don’t realize, and caddy doesn’t remind you there is water short left. The clubhouse is a let down in my view with food and drink prices wholly out of proportion with the rest of Marrakech and more expensive than prices found in London or world class golf ‘resorts’ like Turnberry. The service is not particularly world class either. The course itself though is well worth a round of holiday golf. As I found at Amelkis the day before, when I played one of the original nines along with a newer nine, I much preferred the older, established Atlas course here (holes 10 to 18) to the newer Tensift (holes 19 to 27). Of course, it’s resort golf all the way – minus the buggies, but with a caddie (for a very reasonable fee) – where fairways wind around a number of fountained lakes that were teeming with all sorts of exotic birdlife. I liked in particular the two par threes on the Atlas course, especially the second (at hole 17) which calls for an all carry tee shot across water. The new nine is located a bit to the north west of the property, requiring a buggy transfer, but the club has one of those elongated versions that can comfortably take four golfers plus caddies in one go. This loop is wider and less tree-lined than the old course so I felt a lot of the holes lacked definition but I’m sure that will change in time as the vegetation flourishes naturally. The greens have been sown with a different type of grass so they were, if anything, slightly better than the (excellent) putting surfaces that we played on our front nine. I enjoyed the playing experience at Palmeraie more than I did at either Amelkis or Al Maaden – not that the other two are bad courses, they aren’t; they just didn’t match the layout and conditioning of this more established place.